I usually don't post too much music news, but today I can't pass it up! My most anticipated film this year is no doubt "Where the Wild Things Are" and one aspect to the film that I have been uber-excited about is the soundtrack by Karen O of the Yeah Yeah Yeahs. Pitchfork media broke news this afternoon that the first single to the soundtrack will hits iTunes on Tuesday Auguest 25th! 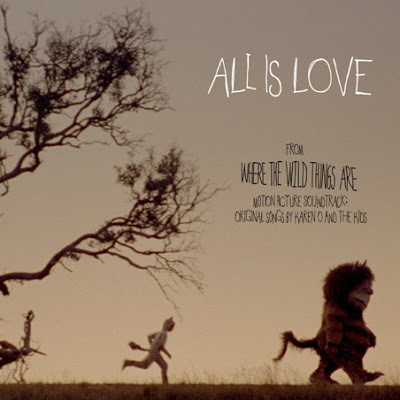 The single is called "All is Love" and was featured in the mini documentary shown at Comic Con and later released online. The full soundtrack will be available September 29th a few short weeks before "Where the Wild Things Are" hits cinemas. Karen O has dubbed the group of musicians who collaborated on the soundtrack as Karen O and the Kids. Here's just a few other talented musicians Karen O has surrounded herself with for the soundtrack: Deerhunter/Atlas Sound mastermind Bradford Cox, Imaad Wasif, fellow YYYs Nick Zinner and Brian Chase, Dead Weather/Raconteurs members Dean Fertita and Jack Lawrence, Liars' Aaron Hemphill, the Bird and the Bee's Greg Kurstin, Services' Tristan Bechet, and Gris Gris's Oscar Michel, as well as a children's choir. The soundtrack was co-produced with the Afternoons' Tom Biller.